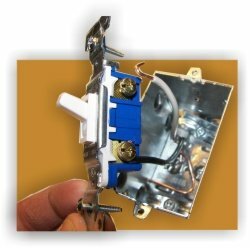 Wiring a light switch? Here's how. 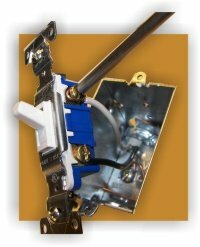 I would have to say wiring a light switch is one of the most basic wiring projects in your home. I'm talking just your normal run-of-the-mill switch. ON - OFF. No bells, no whistles. I know you can get fancy with 3 way switches, 4 way switches and dimmers, but we can get to those later. 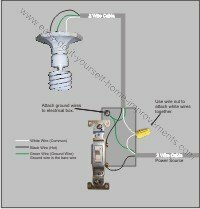 Right now I will show you how easy it is to install a single pole switch. 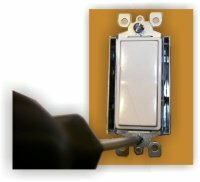 With the power coming to the switch and then going to the lights, you will notice that there are two black wires, two white wires and two ground wires (bare wires). First of all we should connect the ground wires to the box. (assuming it is a steel box). 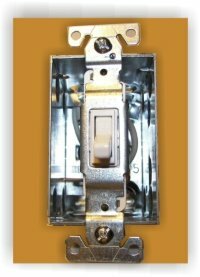 If the light switch has a ground screw on it (usually green and at the bottom of the switch), connect it now. Second twist the two white wires together and screw on a wire nut. It is usually a good idea to put some black electrical tape around the nut to make sure it doesn't come off. 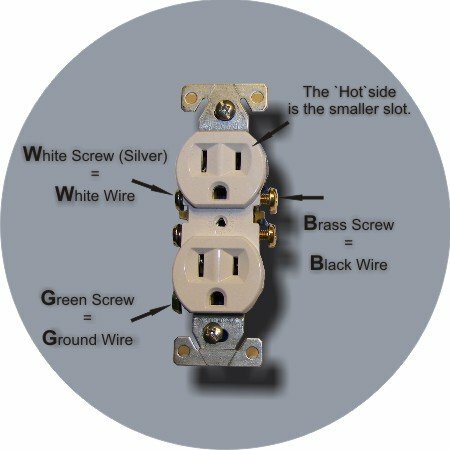 As we have learned from the basic wiring terminology page, the black wires are "hot". These wires hold the power. 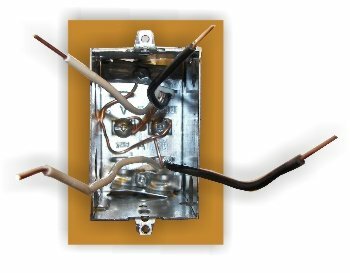 Connect the "source" wire to the bottom terminal of the switch and the other black wire to the top terminal. In this picture, you can see the strip gauge on the back of the switch. 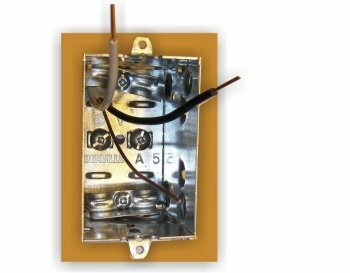 This gauge is when you want to use the "quick-connect" method when wiring a light switch. 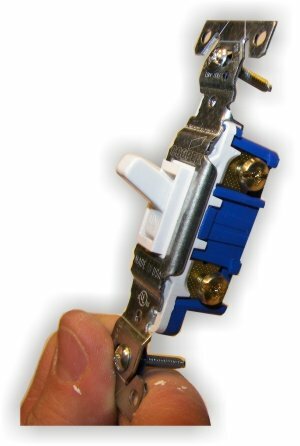 Simply strip the wire to the length specified and push the wire into the hole. That's it. Simple, eh? 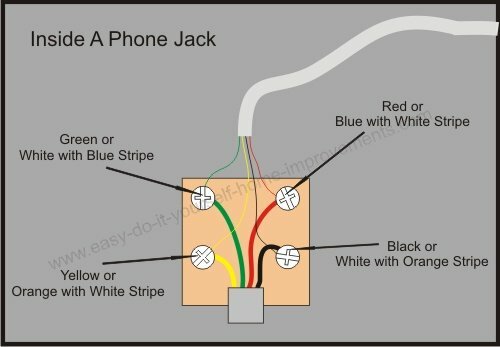 Push the white wires into the box and screw the switch in place. Turn the power back on and test your switch. Oh yes, I see the light! 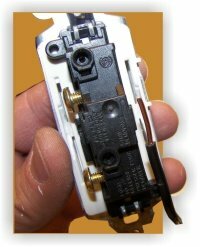 Put your switch plate cover on and you are done! 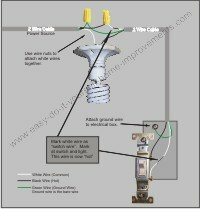 Wiring a light switch with the power coming from the light(s) to the switch is probably the easiest way to wire a switch. 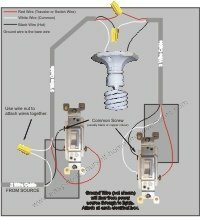 If you have the chance, wire your lights this way as it is the easiest scenario. In your switch box, you will only have one black, one white and one ground wire. Now simply hook the black wire to the bottom terminal and the white wire to the top terminal. Push the switch into the box and screw it in. Turn on the power and test the switch. Everything working? Great. Put on the cover plate and enjoy your new switch. Hey, doing it yourself is great but if you are unsure of the advice given or the methods in which to job is done, don't do it. This site is merely a collection of how some people do home improvements. There is no way we can anticipate every situation and we do our best to inform of any risks for each job. 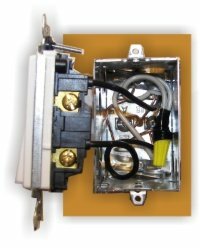 Be sure to check local building codes for proper installation and permits. If in doubt, hire it out.